New Rochelle, NY, October 18, 2016–A home-based palliative care (HBPC) program for individuals with advanced illnesses was associated with a $12,000 reduction in the mean total cost of care per person, fewer hospital admissions and emergency room visits, and greater use of hospice during the final three months of life, as reported in a study published in Journal of Palliative Medicine, a peer-reviewed journal from Mary Ann Liebert, Inc., publishers. The article is available free on the Journal of Palliative Medicine website until November 18, 2016. In the article entitled "The Impact of a Home-Based Palliative Care Program in an Accountable Care Organization," Dana Lustbader, MD and coauthors from ProHEALTH Care–An Optum Company and ProHEALTH Medical Management (Lake Success, NY), Optum Center for Palliative and Supportive Care (Eden Prairie, MN), and OptumCare (Phoenix, AZ), describe a HBPC program that was implemented within an Accountable Care Organization of a Medicare Shared Savings Program. The retrospective study compared individuals enrolled in the HBPC program to those receiving usual care. An HBPC team included registered nurses, social workers, doctors, and administrative staff, each with strong clinical skills in palliative care. Care included home visits, telephone calls, and access to telepalliative care, in which patients and caregivers could interact virtually with any member of the team using a smart phone or computer. "This is strong evidence that home-based palliative care delivers on the value equation–improved quality at lower cost," says Charles F. von Gunten, MD, PhD, Editor-in-Chief of Journal of Palliative Medicine and Vice President, Medical Affairs, Hospice and Palliative Medicine for the OhioHealth system. 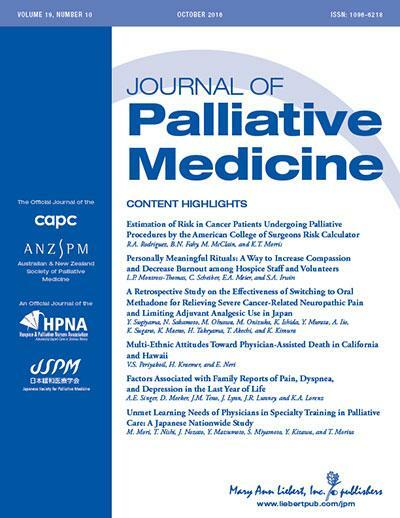 Journal of Palliative Medicine is the official journal of the Center to Advance Palliative Care (CAPC) and an official journal of the Hospice and Palliative Nurses Association. Mary Ann Liebert, Inc., publishers (http://www.liebertpub.com/) is a privately held, fully integrated media company known for establishing authoritative peer-reviewed journals in promising areas of science and biomedical research, including Population Health Management, AIDS Patient Care and STDs, and Briefings in Palliative, Hospice, and Pain Medicine & Management, a weekly e-News Alert. Its biotechnology trade magazine, GEN (Genetic Engineering & Biotechnology News), was the first in its field and is today the industry's most widely read publication worldwide. A complete list of the firm's 80 journals, newsmagazines, and books is available on the Mary Ann Liebert, Inc., publishers website.